In early November 2002, a friend and I had the opportunity to make our first visit to New York City. We met with some fellow RAFLers and went to a preview of Dance of the Vampires. The show was delightful and quite satisfying for our first-ever New York City show! Even more delightful was the opportunity to interview René the next day. Arriving mid-afternoon on Saturday, my friend, who acted as photographer, and I were let in at the back door of the Minskoff Theatre. We patiently sat waiting for René and watched as various actors from the show breezed through on their way to their dressing rooms. 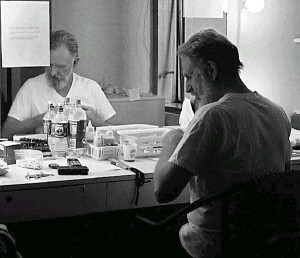 When René arrived, we followed him to his dressing room and took a seat on his couch as he went to the back portion of the room to get a few things he needed. Enthused to be there, we looked out the windows, taking the surroundings of the city outside. We even got a quick surprise visit from Michael Crawford, who popped in to ask René a question! 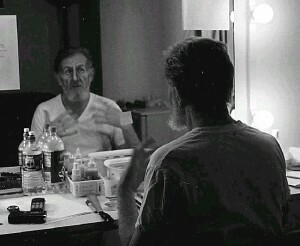 A few minutes later, René emerged, and sat to apply his make-up for the matinee performance. Sitting down next to him, I started the tape recorder and began the interview, all the while watching the mirror as he slowly began the transformation from René Auberjonois to Professor Abronsius. Look out, Buffy. A new slayer has staked his claim in the fight against evil. René Auberjonois, widely known for his roles in Benson and Star Trek: Deep Space Nine, has returned to his theatrical roots in Jim Steinman’s Dance of the Vampires. The once-vampirical mentor in My Best Friend Is A Vampire crossed into the light to become a vampire slayer in the new musical. It has been almost 12 years since Auberjonois tackled a musical role for theatre, being last seen in the 1989-1990 Tony-award winning City of Angels, which garnered him a Tony Award nomination. In that time, Broadway has undergone many changes, most significantly seeing smaller, more intimate performances give way to crowd-dazzling shows with extravagant budgets, lavish sets and pyrotechnics. Looking at the changes in theatre since he began, Auberjonois attributes the newest trend to what he terms the “Disneyfication” of Broadway. “Basically since the The Lion King and Beauty and the Beast, I think people expect Broadway [shows] to be spectacular, huge productions that cost millions and millions of dollars and have big, huge sets,” Auberjonois said. But the term isn’t meant to be a negative; rather, Auberjonois said he believes the new trend has re-energized Broadway, bringing people from across the country to New York City to experience theatre for the first time or simply become reacquainted with it. Despite his absence from Broadway in recent years, Auberjonois is no stranger to musical theatre. He’s been nominated four times throughout his theatrical career, three for musical productions, and a supporting role opposite Katharine Hepburn earned him a Tony Award in 1969’s CoCo. It’s almost funny, considering Auberjonois doesn’t consider himself a singer. Instead, he tends to follow in the steps of Rex Harrison and Robert Preston, two actors particularly known for “talk-singing” their way through musical numbers, which the character actor said is still quite challenging for him. Looking for a project to not only bring him back to New York City, but to also re-immerse himself into theatre, Auberjonois said he was drawn to the show because of writer Jim Steinman and John Rando, the Tony Award-winning director of Urinetown. 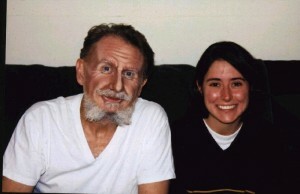 A fan of Steinman’s work throughout the years, Auberjonois said that, coupled with the creativity and imagination of Rando, is what drew him to Dance of the Vampires. In preparing for the role of vampire hunter Professor Abronsius, Auberjonois went back to the original Roman Polanski film, from which the show is derived. But, rather than play him as a spoof of the old Hammer Studio films, as the original movie did, Auberjonois said he decided to make the Professor a more driven, obsessed vampire hunter, similar to Peter Cushing’s portrayal of Van Helsing in the original vampire films. Focusing on learning the breath-takingly fast “Logic,” a musical number that calls to mind Danny Kaye rattling off Russian composers at lightning-quick speed in an old Sam Goldwyn movie, Auberjonois said he wanted to wait until the rehearsal period before truly developing his character. After working in television for many years, Auberjonois said he was concerned about keeping the show alive night after night, and cited that as one of his biggest challenges. But, the collaboration and constant changes of the work in progress were all facets of the process that made his day-to-day work interesting, and rather than find it nerve-wracking, Auberjonois said the continual script changes helped to keep him on his toes. And in the end, that’s one of the main reasons Auberjonois came back to the theater and its many rehearsals. For his fans, it can’t be soon enough.